Manbei Kohayagawa, the easy-going patriarch of a large Osaka-based family, stands out among Yasujiro Ozu’s extensive gallery of father figures. Portrayed by Ganjiro Nakamura, who also appears in "Floating Weeds" (1959), he exudes a spunky energy and boyish sense of mischief that runs quite contrary to the dignified calm and weariness usually displayed by Chishu Ryu. His behavior and the effects it has on those around him all make "The End of Summer" for the most part one of Ozu’s most light-hearted and overtly comedic films. It appeared at the end of his career, just one year before 1962’s "An Autumn Afternoon," his final work, and two before his fatal heart attack on December 12th, 1963 – his sixtieth birthday. Consequently, the film clearly displays the polished technical skill he had accrued by that point, making it a very accomplished and highly entertaining piece of filmmaking. 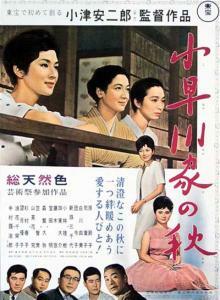 "The End of Summer" features a favorite Ozu subject, a daughter faced with pressure to marry, multiplied by two. In her final role with the director, Setsuko Hara plays Akiko, a widow who lives alone with her young son. Her uncle, Yanosuke (Daisuke Kato), attempts to coordinate a courtship between her and a friend of his who owns a steel mill. In the meantime, Manbei’s youngest daughter, Noriko (Yoko Tsukasa), considers marriage in light of both her faltering business and a potential love interest who leaves for Sapporo for a teaching assistant position – but not before extending an invitation for her to come visit him. The other Kohayagawa daughter, Fumiko (Michiyo Aratama), and her husband Hisao (Keiji Kobayashi), begin to notice their father’s frequent outings on his own and soon discover that he is visiting Tsune Sasaki (Chieko Naniwa), an old flame of his from many years ago. Even though he is grilled by his children (mainly the disapproving Fumiko) about his sneaky behavior, he refuses to reveal the true nature of his activities, and continues to maintain his childlike, carefree manner – even, extraordinarily, when a sudden heart attack casts a more serious light on the film’s events. "The End of Summer" serves as a prime example of Ozu’s skill in using his characters’ situations to highlight certain philosophical questions and truths about life. Manbei’s relationship with Tsune narrowly overshadows the two marriage prospect subplots that his two daughters face, with the cheerful old man’s antics serving as one of the film’s most enjoyable qualities largely thanks to Nakamura’s delightful performance. The older couple’s meetings together are filled with pleasant talk of their previous experiences, reflecting a life happily shared in another time – even though, as Fumiko points out, it occurred at the expense of his poor wife. But nonetheless, to watch them sharing stories and enjoying a treat of sake and shark eggs is to at least understand the justification Manbei sees in eluding and defying his family’s wishes. His actions also invite a deeper consideration of Akiko and Noriko’s situations – specifically regarding whether the women should act to meet the family’s approval or make themselves happy. While Akiko feels the need to maintain her independence even at her age, Noriko is torn between a well-to-do suitor who would benefit the family and her true love interest who awaits her in Sapporo. Tellingly, as Manbei’s health takes some unexpected turns after his heart attack, he constantly serves as a strong reminder of the benefits of a life lived to the fullest with no regrets. As one would expect from the experienced Ozu, "The End of Summer" shows his gift for illustrating the poetic qualities of everyday life in top form. The hot summer weather cast over the film is rendered clearly through the white, short-sleeved collared shirts worn by so many of the men; the buzz of insects; waving paper fans and opened doors revealing bright sunlight and lush green plants. Warmth also emanates from the many gatherings that are portrayed, bringing nice moments of singing, drinking, playful flirting and reminiscing. But, of course, flashes of sadness and reflection occasionally emerge, such as the poignant scene in which Noriko waits with her Sapporo-bound crush for his train to arrive. There is something very heartfelt and inspiring in the way Noriko weighs her dilemma, just as there is in Akiko’s own recognition of what makes her happy in her current situation – not to mention that the occasional scenes of the two sisters talking with one another about their respective issues count among the film’s most memorable. Grouped together with Manbei’s amusing, defiant behavior, their story strands all do much to make "The End of Summer" one of Ozu’s more hopeful and enlightening tales about the quest for contentment in the modern world. Did you know you can shorten your long urls with AdFly and get money from every click on your short links.